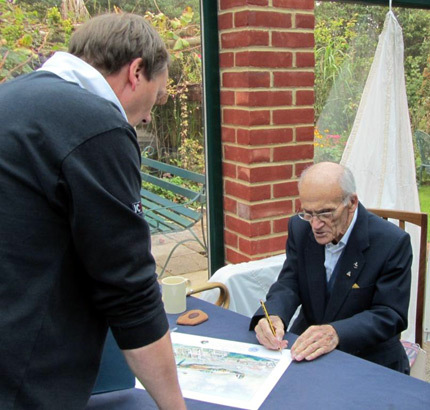 The Museum was very pleased to warmly welcome two wonderful RAF fighter pilot veterans on a chilly Sunday 26th September 2010. 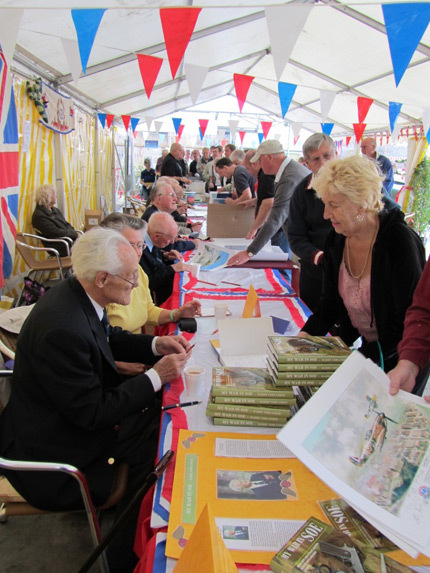 Both Wing Commander Peter Ayerst DFC and Warrant Officer Harold Bennett delighted visitors with tales of their flying experiences and happily signed items to help raise monies for the Pilot Memorials Project. Peter is well known for his exploits with 73 Squadron during the Battle of France and his varied wartime career culminated as a test pilot for Vickers flying Spitfires, much of which is recounted in his book ‘Spirit of the Blue’. Harold saw operational service with 603 ‘City of Edinburgh’ Squadron on cross-Channel sweeps during 1941 before he was shot down over France and taken prisoner. He remained a ‘guest’ of the Germans for the remainder of the war. 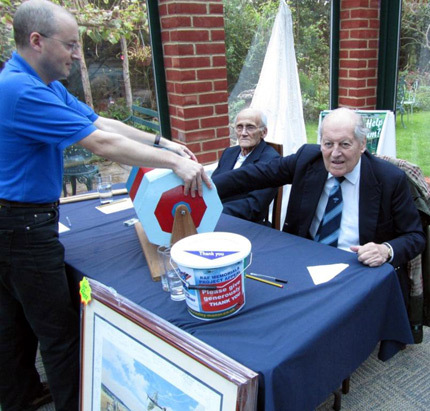 At the end of an enjoyable day, both Peter and Harold took turns to pick the winning tickets for the Museum 2010 raffle. The 1st Prize winning ticket was Yellow 488. Is that lucky winner you? After a week of heavy rain, Saturday 28th August 2010 dawned with much better weather and the event kicked-off as planned at 11:00 AM in time to receive and welcome a great mass of visitors and happily the day remained busy right through to the close of the event at 4:00 PM. The stars of the event were our wonderful veterans and attending were RAF pilots Tony Iveson, Rodney Scrase, Harold Bennett, Peter Hill, Jack Hodges and Ron Pottinger; joining them was ex-SOE member Harry Verlander. 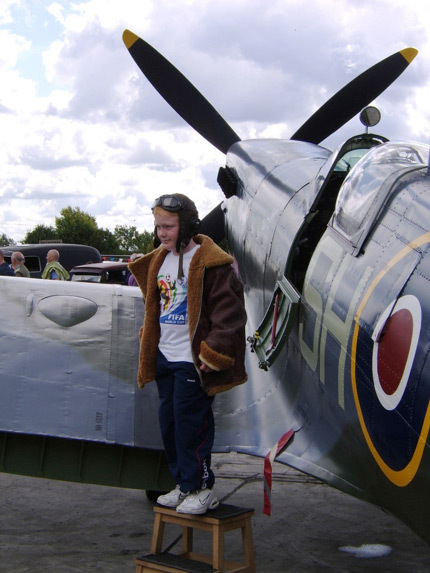 Other added attractions for visitors included a fantastic replica Spitfire from the ‘Simply Spitfire Team’, who raised monies by allowing visitors to put on an Irvin jacket, leather flying helmet and goggles and have their picture taken with the Spitfire. 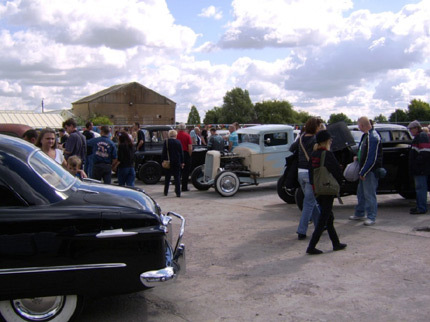 There were many superb Hot Rods courtesy of the Detonators Car Club and other private owners of classic vehicles that included Willy’s Jeeps and motorcycles. 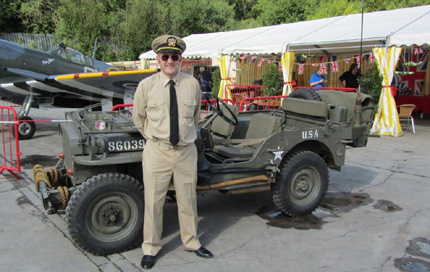 Big thanks goes to our wonderful veterans for being so supportive to our fund-raising cause and we also thank everyone who helped on the day to make it enjoyable for all and a fantastic sum was raised towards the Museums Pilot Memorials Project. Much appreciation is extended to the Ruxley Manor Garden Centre and the very helpful staff for being such excellent and generous hosts. 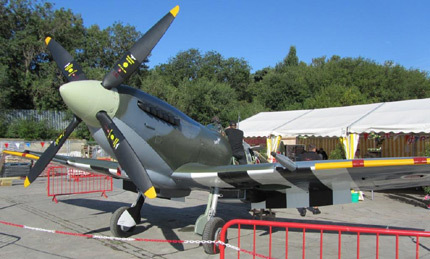 You are currently browsing the Shoreham Aircraft Museum – News archives for September, 2010.